Our Colombo cruise port guide gives you information about the docking location, cruise dock, transportation options and much more! Welcome to the Colombo cruise port guide. At the heart of the Indian Ocean we find Sri Lanka with its capital city Colombo. Sri Lanka is known as the “undiscovered country” or “pearl of the Indian ocean”. You will find endless beaches, timeless ruines, welcoming people and the world famous tea here. It truly is an island you are going to fall in love with. It has so much to offer that a day is simply not enough. But while you are here why not try to get a taste for this destination. You have plenty of options. Visit the cultural capital of Kandy or Galle with its incredible history. Befriend an elephant or two at the Pinnawala Elephant Orphanage or simply stay in town to get acquainted with the local way of life. Colombo’s history is a vibrant one. The arrival of the European superpower in medieval times would kick off a struggle that would last for centuries and would only end recently. The Portuguese, the Dutch and the British have left their mark on Sri Lanka and Colombo. These are still visible especially in the district in front of the ship called Fort Colombo. 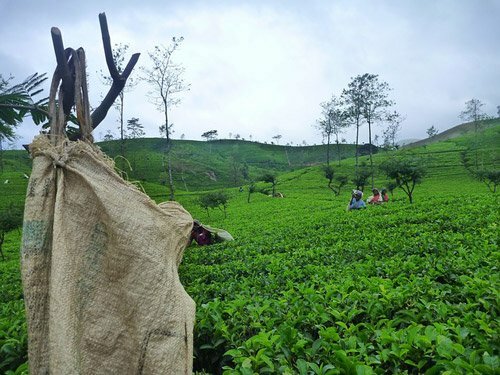 Inland, where the British would introduce tea production to the island, is where the imported Tamil labourers from India and Sinhalese descent would work the plantations eventually causing the first spark that would lead to one of the biggest civil wars the world has ever seen. Recently the issues have been resolved and it is clearly visible from every corner of the island that the inhabitants of Sri Lanka are on the path forward. 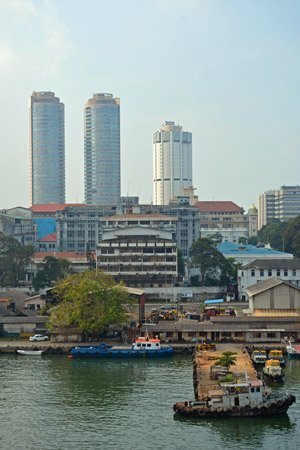 Colombo is cleaning up and is transforming itself into a successful business centre and attractive tourist destination. Find out underneath what it is you want to do in the Colombo cruise port guide. 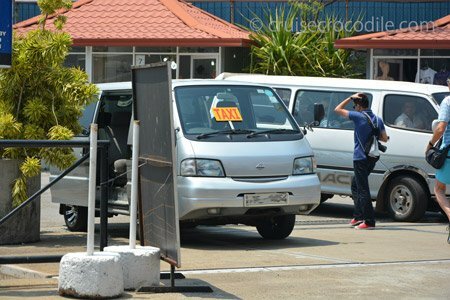 – There are 2 cruise docks available in the Port of Colombo. – The main cruise dock is about 1 km away from the historic center of Colombo. – Taxis are often available at the cruise port. Once your ship is docked in Colombo this is the view you will have. 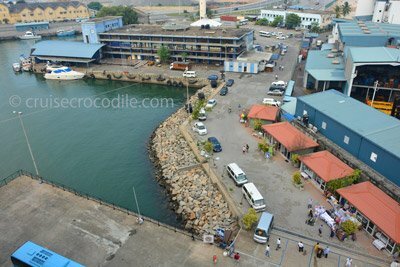 As you can see there are some vendors on the dock selling very nice souvenirs and there are taxis waiting for you as well. If you want to walk out of the port area simply walk to the main road you see in the back of the picture and turn left here. From here you have several exits in the port that you can use. We suggest you take the 2nd exit you come across. This is about 700 meters from the pier. There are always taxis waiting for you on the pier. These taxis are here to give you a taxi tour. Negotiate the price before stepping in. This is a picture you can take from the ship as soon as you are docked. You will have a beautiful view over district Fort Colombo. 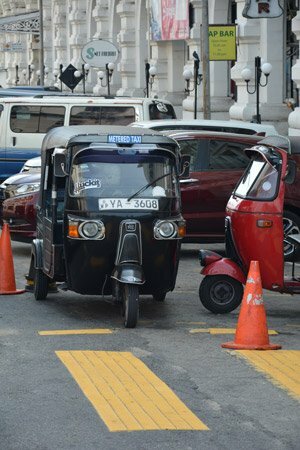 You will see these famous rickshaws all over town. Hopefully you will get a ride on one of these as well. They are cheap, fast and can get you anywhere in town. Use them for a short ride around town or for a taxi tour. Any one way ride within the city should not cost more than 10 US dollar and except you pay no more than 10 US dollar per hour for a tour. 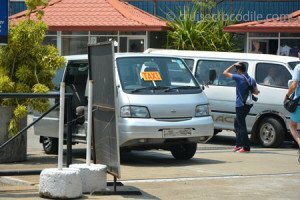 The drivers accept Sri Lankan Rupee and Us Dollar. Sri Lankan tea: It’s the British that brought over tea. They turned Sri Lanka into a tea estate, which today is still one of the main export products. Pick up Ceylon tea as a local souvenir while you are there. The most famous brands are Mlesna, Dilmah, Zesta and Ceylonta. –Fort Colombo (district 1): about 1 km south of the cruise ship. This area is the historical district that will tell you lost about the colonial history of Colombo. 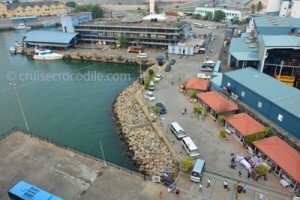 –Pettah (district 11): about 1,5 km south east of the cruise ship. This is the liveliest neighbourhood of Colombo. Find the local markets and the busy laborers at work here. –Cinnamon gardens (district 7): about 6 km south of the cruise ship. Is where in the 17th century the cinnamon plantations used to be. Nowadays it is part of the city centre. –Slave island (district 2): about 3 km south of the cruise ship. It is not an island at all, but it is named Slave island because mainly the Dutch were selling slaves here during colonial times. As you can see in the map above it is possible to do a lot on foot in Colombo and we think districts Fort Colombo and Pettah are best to explore by foot. Perhaps if you want to go further south to Cinnamon Gardens and Slave Island it is a good idea to opt for a rickshaw tour. There is a lot of price difference in rickshaw tours and the main reason for this is: you. You have to bargain with the rickshaw driver before stepping in. Not doing this will most likely resolve in being ripped off. When bargaining with them please know 10 US dollar per hour for sightseeing is the maximum of what you should pay. There are only beaches north and south of Colombo, but not in the city of Colombo itself. Travel to Mt. Lavinia (15 km south of Colombo) for a nice day at the beach or perhaps to have a food tasting at one of the many food vendors there. Best way to get here is by rickshaw. In Pettah (distric 11) all religions are present and that means also Hindus have their own spot here. This Hindu temple lies at the heart of Pettah. Get a glimpse of Hindu life here. 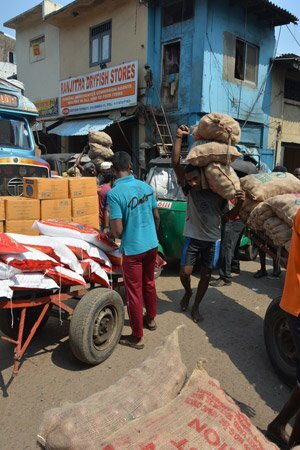 In Pettah (district 1) we find the famous local market. Any local ingredient are sold on this vibrant market. Many workers proudly display their ingredients. Pick up your local spices here. The old Dutch hospital is considered to be the oldest building in the Fort area. This is where the Dutch and other nationalities would enjoy the best possibly hospital service you could imagine. Being in the hospital here would get you a private cook and personal care. Today the city did a really nice job in implementing this building in modern day desires. It is the best place in town to go for drinks or for dinner in the evening. Just 1,5 km east of the port we find Pettah (district 11). This is without doubt the liveliest place in town. Hundreds of men and women come here every day to do hard labour to make an honest living. It is unbelievable what a chaos it can be in this part of town because of it. Traffic jams like you see on this picture are daily business. It is truly the district you cannot skip while visiting Colombo. It gives you a sense of local life and much respect for the locals! In the middle of the island, at about 4 hours drive, you will find the cultural capital of the island: Kandy. Kandy served as the capital of the last Sinhalese kingdom which would eventually fall to the British in 1815. Today the Temple of the Tooth is one of the most well known shrines in the Buddhist world because it houses a tooth relic of the Buddha. In Pettah (district 1) is where we find the Jami-ul-Alfar mosque. Pettah is the district where all religions come together and in the Muslim area we can find a very striking structure from 1909. It is one of the oldest mosques of Colombo and it draws immediate attention because of it red and white stripes. It is not open to non-muslims. According to many the best restaurant in town and therefore reservations are highly recommended. You’ll find this superb fish restaurant in Dutch Hospital. At the spot where the Central Bank bombing of 1996 took place is where nowadays you can find at the Economy History Museum. Step into its beautiful atrium from where you can explore the interactive exhibitions. Visit Sri Lanka’s best attraction: the Pinnawala Elephant Orphanage. The facility was established in 1975 for orphaned baby elephants that were found in the wild. Today the facility is open for you to visit en befriend one of the hundred elephants that stay here today. The elephant orphanage is about 2,5 hours drive from the Colombo cruise port. The historical centre of Colombo is Fort Colombo (district 1). During the Dutch and British occupation this was an actual fort. Build to defend the colonising powers from any local forces. Fact is that the Portuguese started to develop this area. Later when the Dutch took over they developed this area. During the rule of the British the wall were torn down and this was made into a high end heart of the island with more British names and brands you could imagine. Although today the architecture is crumbling, it is still a reminder of colonial powers and their influences. This is a national monument in Sri Lanka. It was build for the commemoration of the independence of Sri Lanka from the British rule with the establishment of the Dominion of Ceylon on Febraury 4th, 1948. It also houses the Independence Memorial museum underneath. This is the largest and most important museum in Sri Lanka. The collection was established by Willian Henry Gregory in 1877 and it has grown to a superb selection or historical artefacts. Wander the halls of the museum to get an inside look in the different civilisations that lived here at one point or another. Many T rooms might have a good name because of their quality of service, but this T-room is where the Duran Duran video clip for Hungry like a Wolf was shot. Find it in Fort Colombo (district). See map for location. This temple complex is a must see in Colombo. It is the most prominent buddhist temple of Colombo. Find several halls for worship, see the buddha wall and the large collection of things in the museum. In the middle of Fort Colombo (district 1) we find this famous landmark. It is the original lighthouse that used to guard the entrance of the port. Nowadays it stands here in the middle of the historical district as a clocktower. This famous Scottish department store even made it half way around the world to Colombo. Still today you can find the old Cargills department store building. This beautiful colonial building now houses a supermarket and Kentucky Fried Chicken. Rather fancy location for a structure with such history. Originally named Queen Victoria ,this public park located next to city hall is the oldest and largest park of the city. Find this huge buddha statue, several water fountains and a children’s play area inside. Back in the days during colonial times the ladies would come here for a stroll and today families, couples and friends still come here for whatever reason. Galle Face Green promenade is a long stretch of green on the coastline just south of Fort Colombo that functions as a recreation area. Meet the locals, visit the food stalls or just hang out like everybody else does. Just a few hundred meters from the ship you can spot this Stupa. On top of a huge yellow arch is a giant dazzling white Buddhist bell or Stupa. It is open for the public and you can even go up if you like. Galle is the biggest destination in the south. It is well known for its Dutch Colonial history of which the remains still stand today. Be swept away by the culture, history and local artists. Find Galle at about 2,5 hours drive south of the Colombo cruise dock. Beira lake is a set of 2 lakes in the middle of the city centre. The smaller one is quite interesting. Here you will find several temples and religious sites and also this bridge. It connects to a small island in the middle of the lake officially called Children’s Park, but also known as lovers island. Showing affection in this country is still taboo and something young lovers come here to hold hands. Therefore you can also nickname this bridge “lovers bridge”.